UAlberta Eco-Car team leader Nik Viktorov, seen here are the official unveiling of the group’s new car, Alice, says the team and car are ready to compete. 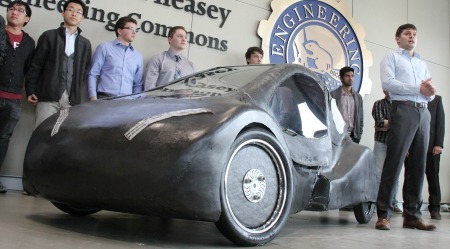 The U of A team is bringing its brand-new car, named Alice, to compete in the Shell Eco-Marathon Americas competition. The Eco-Car group is competing in what is largely considered the most challenging group, the Urban Concept—hydrogen fuel category. If the team finishes in first or second place—and it has held the top two spots every year it has competed—it also wins entry to the Shell Eco-Marathon race in London, England this July. Alice is pretty much a completely new car. It has a new design, new shell, chassis, and wheels. And team leader Nik Viktorov, a third-year chemical engineering (co-op) student, says the team has high hopes. Overall, Alice is about 20 per cent lighter than her predecessor, Steve. “We hope to translate those weight savings into energy efficiencies,” Viktorov said. Vehicles entered into the Urban Concept category need to look and drive like something consumers would actually buy. The vehicle has brake and signal lights, rear-view and side-view mirrors and a seatbelt for the driver—Alice is a one-seater. The vehicle runs on of a hydrogen fuel cell. As well as passing technical tests and design reviews during the competition, Alice will be put to the test on a track. The race requires vehicles to travel eight miles in a minimum of 24 minutes. The car completing the route using the least amount of energy wins. 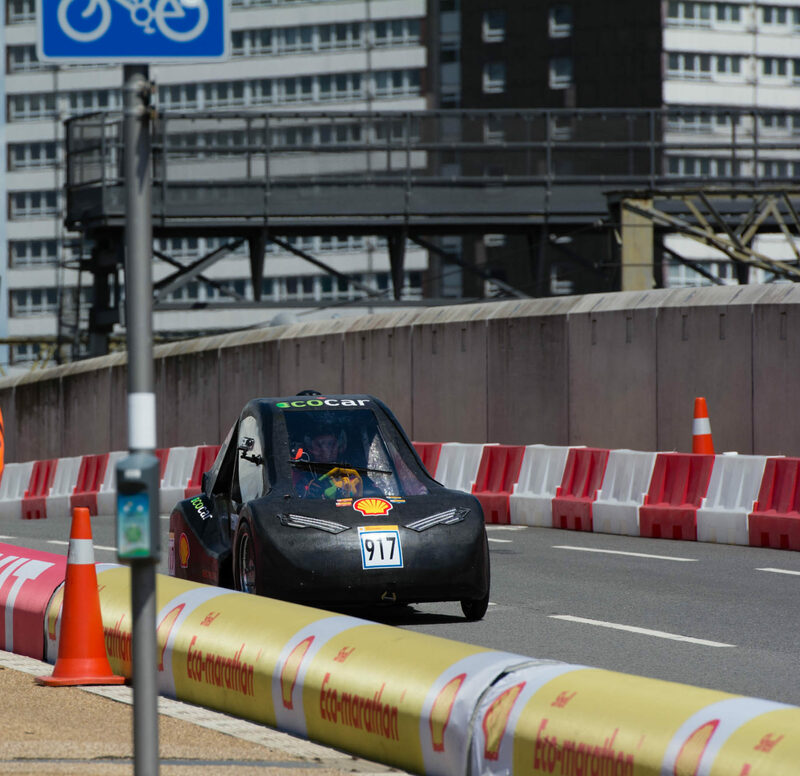 In previous competitions the team has completed the course using the energy equivalent of 618 mpg (0.1 L/100 km). As well as building a new car this year, the team also won second-place in a competition held by Shell Canada between Canadian university teams attending the U.S. competition in Detroit: the U of A team won hotel accommodations for eight at the competition. The irony is that the rooms will get light duty: Viktorov says the team will be camping out at the convention centre again this year, sticking together and staying close to the heart of the event. Another advantage will be having many hands on deck to help solve any technical challenges that arise. The team has another major win under its belt this year: with assistance from the Spirit of George Ford Endowment Fund, an online crowdfunding campaign launched this spring raised more than $10,000, helping to ensure the group’s future. The Shell Eco-Marathon Americas runs April 21 – 24.